The Environmental Working Group’s (EWG) annual list of the “Dirty Dozen” fruits and vegetables came out in April. It identifies which produce carries the most pesticide residue, even after washing. It ranks pesticide contamination on 48 fruits and vegetables, based on 28,000 samples tested by scientists from the U.S. Department of Agriculture and the Food and Drug Administration. Sadly, apples top the list. This is not mean to be alarming – food growers assure us that everything is safe. But the list is informative. Happily, EWG releases a companion list called the “Clean Fifteen.” These have the lowest levels of residue. The list begins with asparagus and includes things like cantaloupe, mangoes and sweet potatoes. This doesn’t mean that you have to empty your wallet on organic produce at Whole Foods. Even the EWG suggests that, from a health standpoint, it is better to eat fruits and veggies – even conventionally grown – than to go without. But it is notable that last year the American Academy of Pediatrics issued a warning against pesticides in kids’ food. 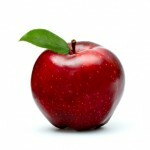 For me, I will be re-thinking the apple in my daughter’s school lunch box. For you, now that you know what’s “hot” – pesticide-wise – and what’s not, you can adjust your eating habits as you wish. For more information you can see the whole list list 48 fruits and veggies.